Brian Donnelly (born 1974), professionally known as KAWS, is a New York-based artist and designer of limited-edition toys and clothing. He currently lives and works in Brooklyn, New York. KAWS was born Brian Donnelly in Jersey City, New Jersey. He graduated from the School of Visual Arts in New York with a Bachelor of Fine Arts in illustration in 1996. After graduation, KAWS briefly worked for Disney as a freelance animator painting backgrounds. He contributed to the animated series 101 Dalmatians, Daria and Doug. He began his career as a graffiti artist growing up in Jersey City. After moving to New York City in the 1990s, KAWS started subverting imagery on billboards, bus shelters and phone booth advertisements. These reworked ads were at first left alone, lasting for up to several months, but as KAWS’ popularity skyrocketed, the ads became increasingly sought after. He has also done work in Paris, London, Berlin and Tokyo. In 1999 KAWS began to design and produce his first limited-edition vinyl toy with the Japanese clothing brand Bounty Hunter, which was an instant hit with the global art-toy collecting community. He has collaborated with other Japanese companies like A Bathing Ape, Santastic, and Medicom on further toys. More toys and later clothing were made for Original Fake, a collaborative store with Medicom Toy, in the Aoyama district of Tokyo. This venture ended on May 31, 2013 as KAWS and Medicom Toys decided to close down the Original Fake brand after almost seven years on the street-wear scene. KAWS has participated in many other commercial collaborations, including with Nigo for A Bathing Ape, Jun "Jonio" Takahashi for Undercover, Michael "Mic" Neumann for Kung Faux, and projects with Burton, Nike, Vans, Supreme and DC Shoes. There are KAWS-designed limited-edition bottles for Dos Equis and Hennessy, rugs for Gallery 1950 and packaging for Kiehl's Cosmetics. 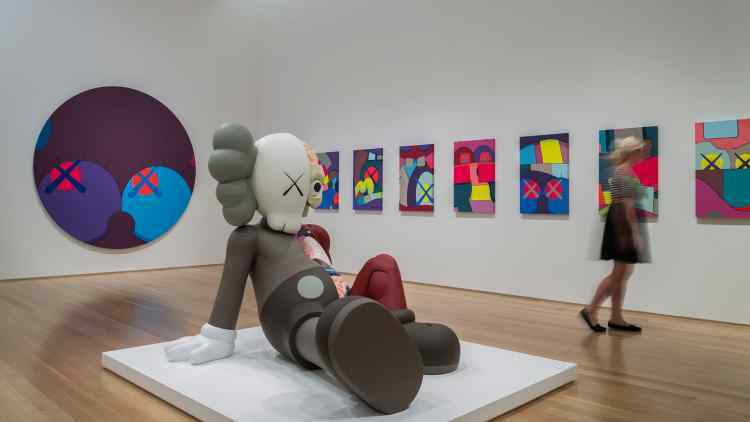 For the 2013 MTV Video Music Awards, KAWS' company redesigned the iconic moon man statue and illustrated various magazine covers for The New Yorker, Clark Magazine and I-D. He created cover art for recording artists Towa Tei, Cherie, Clipse and Kanye West. In 2014 he collaborated with his longtime friend Pharrell Williams on the bottle and design for the perfume "Girl" Williams had created with Commes des Garcons to celebrate his solo album of the same name. In 2016 KAWS collaborated with clothing store Uniqlo to produce a line of tees and accessories with KAWS designs that were sold for low prices. The collection sold out very quickly upon release, but was restocked a number of times.